This beautiful atlas was created by Hovhannes Amira Dadian from the Armenian Mekhitarist monastery located on the Venetian island of San Lazzaro in 1849. This is the first atlas in the Armenian language and boasts ten hand-colored double-page maps, including one of the solar system. 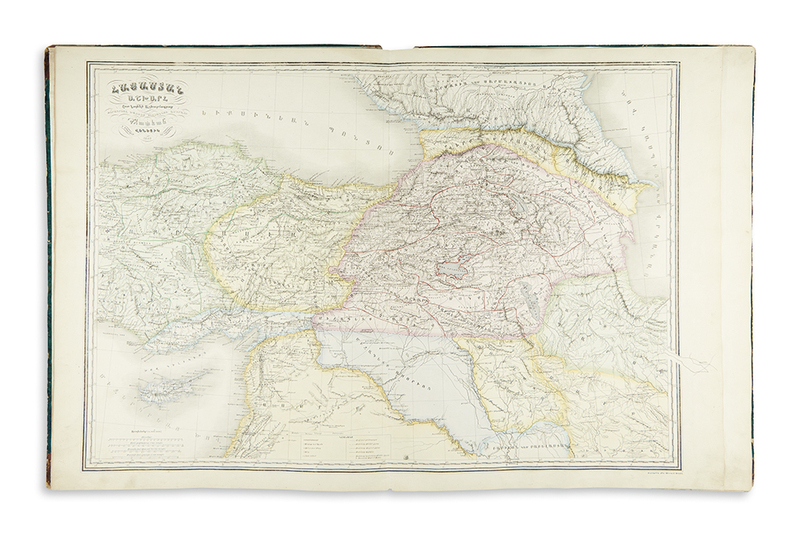 During the Swann Galleries’ biannual auction of Maps & Atlases, Natural History & Color Plate Books on June 7, the Armenian atlas exceeded its expected bid and reached $37,500. The first world atlas in the Armenian language. 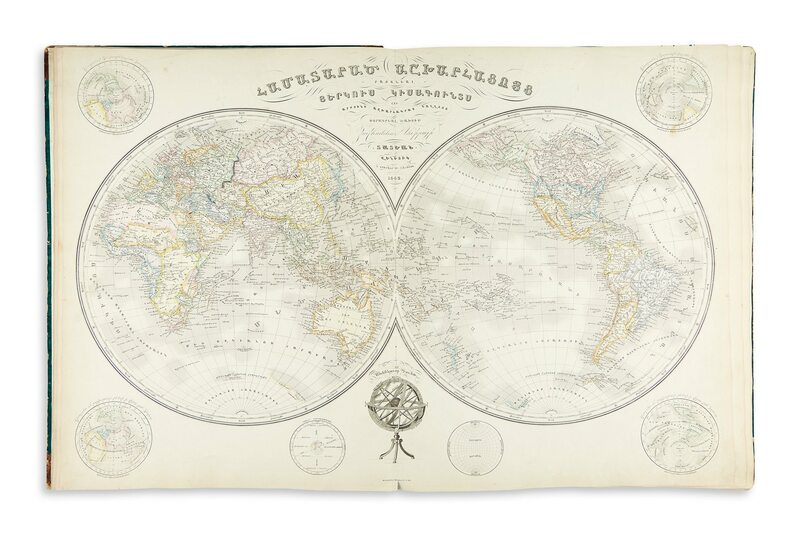 The maps consist of the solar system, the world in double hemispheres, Europe, Asia, Africa, North America, South America, Oceana and individual maps of ancient Armenia and the Ottoman Empire. Each map was engraved in Paris and is primarily based upon contemporary French models. The Mekhitarist monastery on the island of San Lazzaro in Venice has long been a center of Armenian culture, study and publishing. 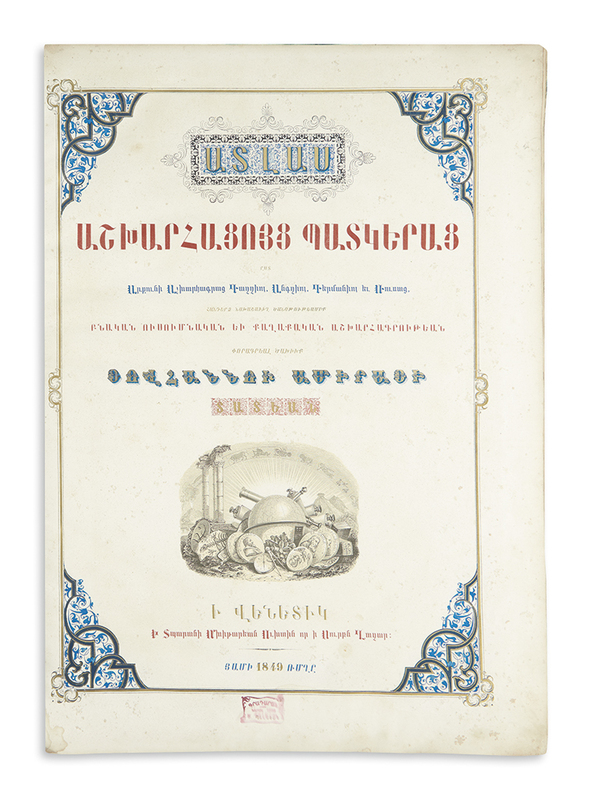 Armenian-related books, pamphlets and maps were produced at the monastery’s presses from the late eighteenth century until the late twentieth. Hovhannes Amira Dadian (1798-1869) was a member of an entrepreneurial family of the noble and privileged Armenian Ottoman class. Dadian’s influence is characterized by his thirst for knowledge and his efforts to implement and improve centers of modern industrialization in many pockets of Turkey, having traveled for several years in Europe as a subject of the Sultan in search of ideas and innovation. His desire to bring updated western ideas of technology and education to his own country leaves little surprise to find Dadian’s name attached as the patron to the present publication of mid-nineteenth century geography. 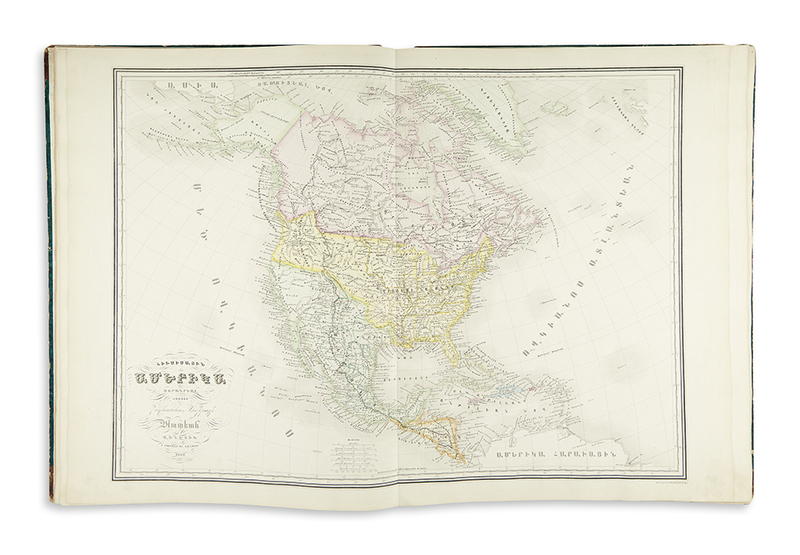 The atlas has appeared at auction only once, in 1975. Rouben Galichian, Historic Maps of Armenia (2004), page 202-204; “The Dadians and Early Ottoman Industrialization”, Haigazian Armenological Review, volume 8, 1980, pages 199-207.